The UPK Knowledge Center offers SCORM-compliant management and deployment of content and is known as a Learning Content Management System (LCMS). It has been shipped with UPK as an integrated module since 2006, but many UPK users don’t utilise it to its full potential. Role assigned learning, e.g. Job or System role. Assessments aligned to both classroom and eLearning courses, to prove knowledge and understanding before and after courses. Pre-assessments to save users having to complete courses when they already have the required knowledge. Hosting of third party SCORM content – not just UPK courses, thereby providing one Training Portal for all SCORM compliant learning. Deep-dive reporting to identify process or configuration issues via user assessments. The UPK Development Library consists of Modules, Sections and Topics as well as any Assessments you have created. Key information can be provided in Concept Panes, which present the content to the users and explain the steps necessary to complete it. Concept Panes can hold text, images, hyperlinks, multi-media elements or even full-blown web pages. Content is imported into the UPK Knowledge Center as Titles and assigned to Knowledge Paths, which allow you to specify content according to User or User Group. As the users work through content their activity is tracked and can be reported to enable assigned Reporters to monitor progress. 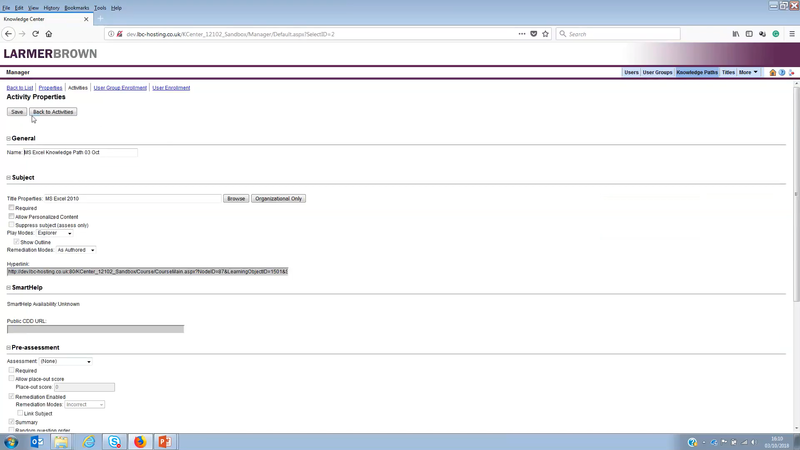 When a user logs into the UPK Knowledge Center they will only see the Knowledge Paths that are appropriate to their role, if they use the Knowledge Paths section of the Knowledge Center. You can also offer users the option to enrol onto further courses that they may be interested in. In order to deploy your UPK content in the Knowledge Center, the first thing you must do is import your UPK Player Package. 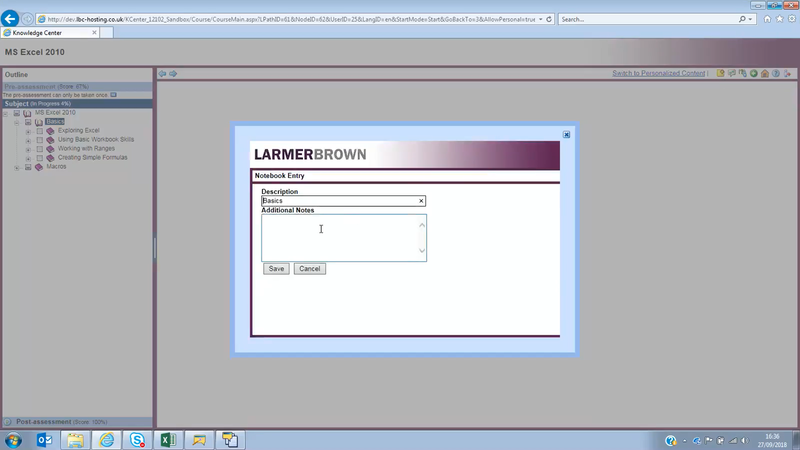 This is imported as a zip file containing your SCORM packaged content. 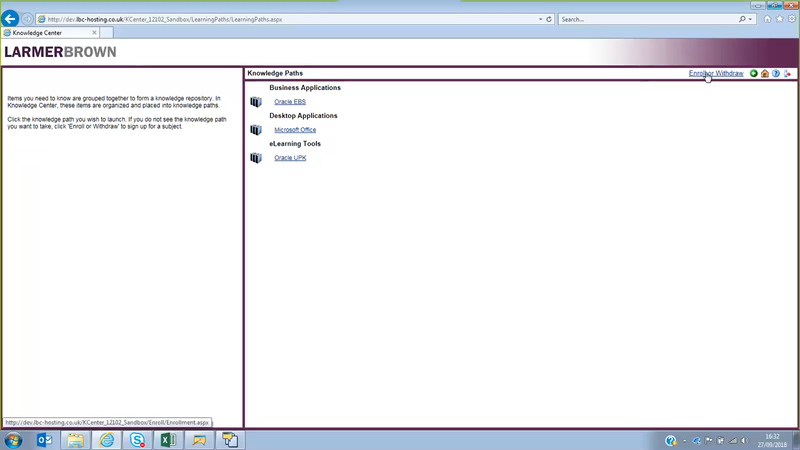 As soon as this is uploaded, go to your Knowledge Center Home page and you will see the content in your Player package. What you want to do next is include this content as part of a Knowledge Path – you can create either the Knowledge Path or the User Group first. User Groups are set up within the Manager. Once your User Group has been created, you can enrol users into this Group. User Groups can also be imported from Active Directory an Excel spreadsheet or a separate database. Next, go to Knowledge Path Management and create a Knowledge Path. You can allow users to self-enrol on the course or select User or User Group Enrolment to assign a particular User or User Group to this course. In order to link your Title (aka Player Package) to a Knowledge Path, you need to create an Activity, or number of Activities. You can have a tiered approach, so that users have to complete Activity A before moving on to Activity B, etc. 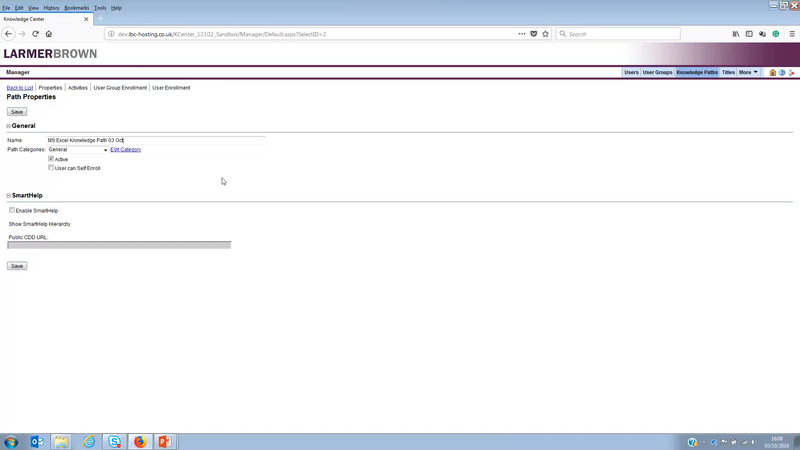 You now have a working Activity attached to a Knowledge Path, which is attached to a User Group for your users to access and complete, with full tracking and reporting. Pre and post assessments can be incorporated into your Knowledge Path at this point. A pre-assessment is a mandatory set of questions that a user must complete before beginning a course. Any assessments available for a course will be listed in the appropriate field. These assessments are created in UPK and imported into the UPK Knowledge Center with the Player Package. There are several options available when setting up your assessments, including whether it is required (mandatory) or not, if there is an opt-out score, i.e. if the user achieves over a specified percentage in an area, the content becomes optional, and if remediation is required should a user get a question wrong. You can also randomise the question order and specify a pass mark. 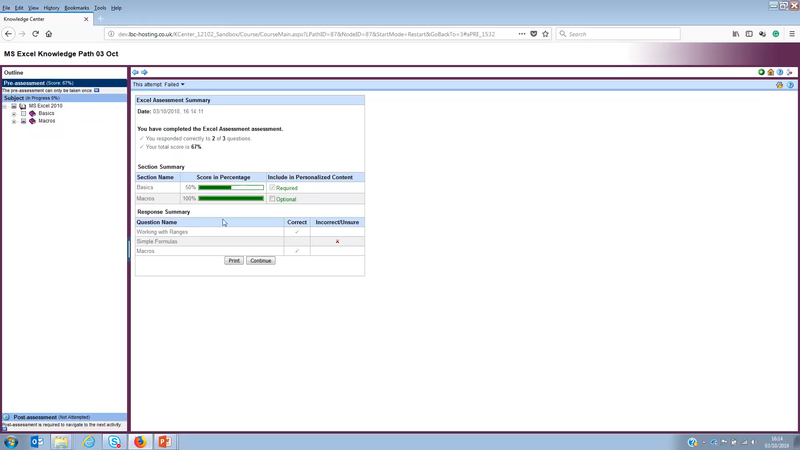 Once the user completes their pre-assessment, the completion screen shows how they performed. The Usage Summary report, which the user can access from their UPK Knowledge Center home page, provides a snapshot of their performance for each course. 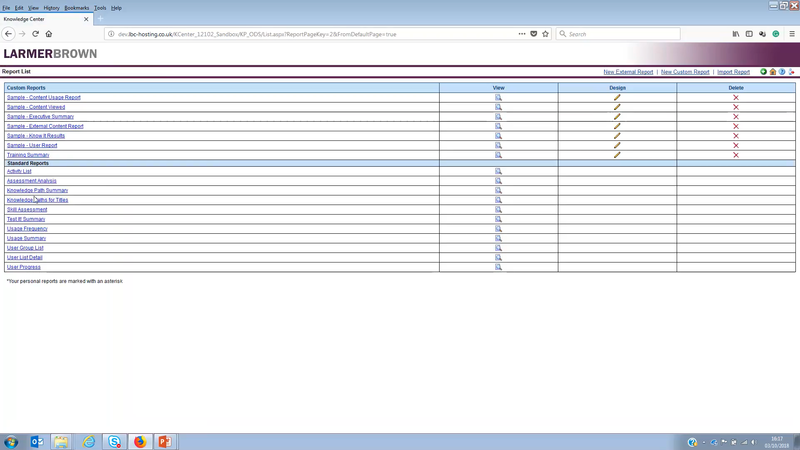 The Reports section in the UPK Knowledge Center is available to those given the required access privileges (such as Managers) and provides additional data including User Progress, which reports on a particular Knowledge Path or User Group, by date or location, etc. You can also identify Skills for a user, by viewing the results of their individual assessments by course. Analysis of an assessment against a course can be undertaken to identify how many assessments have been taken and pass / fail rate, as well as which particular questions might be most frequently resulting in incorrect answers, etc. 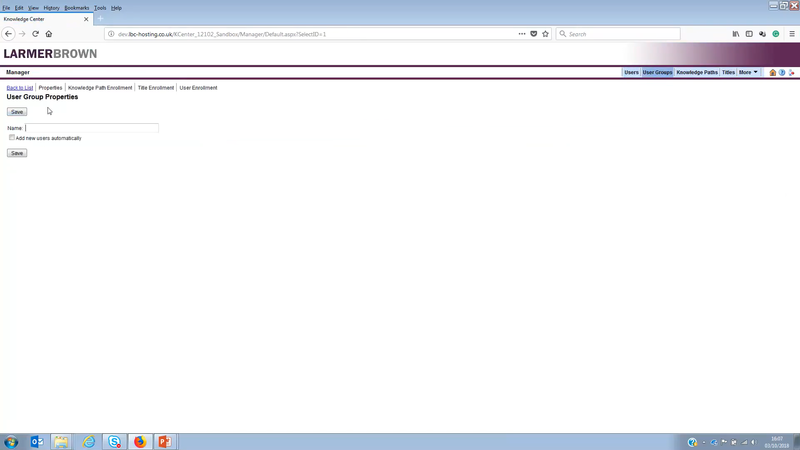 Add a Note, which is a bookmark to a page, to allow the users to jump straight back to a particular point in a course. Allow Feedback on a course. This could go to a mailbox for your Developers or Instructional Designers so that they can receive feedback on a course. They wouldn’t necessarily expect to respond to this. 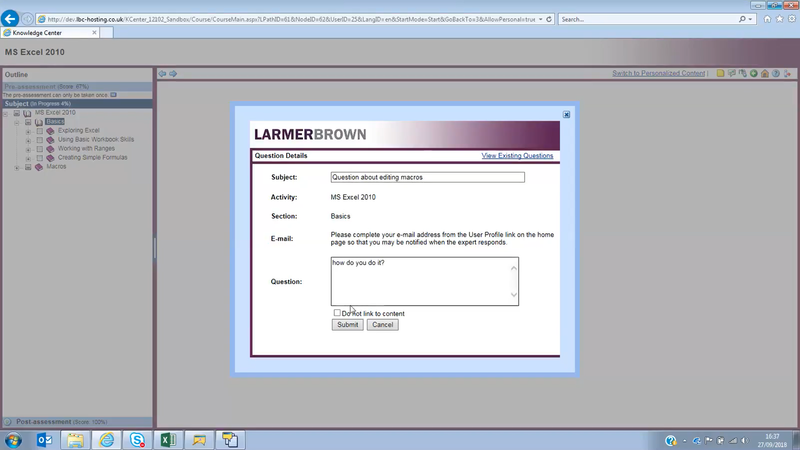 Submit a Question enables users to raise questions to an expert about the content of a course. Your assigned expert would receive an email and they could then respond to this. Providing your external content is SCORM (2004) compliant, it can be imported into the Knowledge Center, linked to Knowledge Paths, assigned to user groups and tracked. This effectively enables you to utilise the UPK Knowledge Center as an independent, ‘Lite’ LMS. To import external content created outside of UPK, simply follow the same process as I have already outlined. 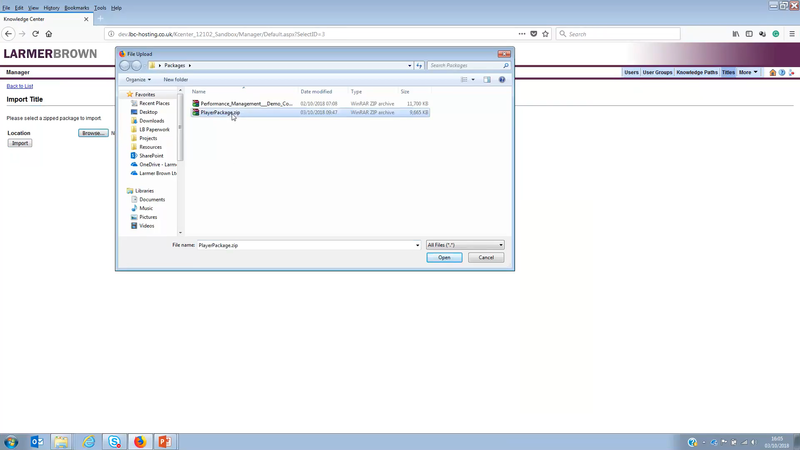 Within Title Management, the content is marked as external. The content won’t be available within the Player section of the Knowledge Center because it hasn’t been created in UPK, but it can be assigned to Knowledge Paths and pushed out to users in the same way as any UPK content. When external content is added as an Activity within the Manager, the additional options to include pre and post assessments won’t be available because these options are only for UPK content. If your third-party content contains assessment, this can still be tracked, however. As a user completes an external course, the UPK Knowledge Center will track progress, mark as complete and report on this. Custom reports can provide additional information, including user assessment scores and session history. As UPK and the Knowledge Center enter end of life, the option to incorporate content from external sources offers you an opportunity to extend the return your organisation has made in UPK. Offering one portal for both existing and new content minimises the change from the user perspective. If, and when, you chose to migrate to a new content development tool, you don’t necessarily need to make UPK in its entirety redundant. 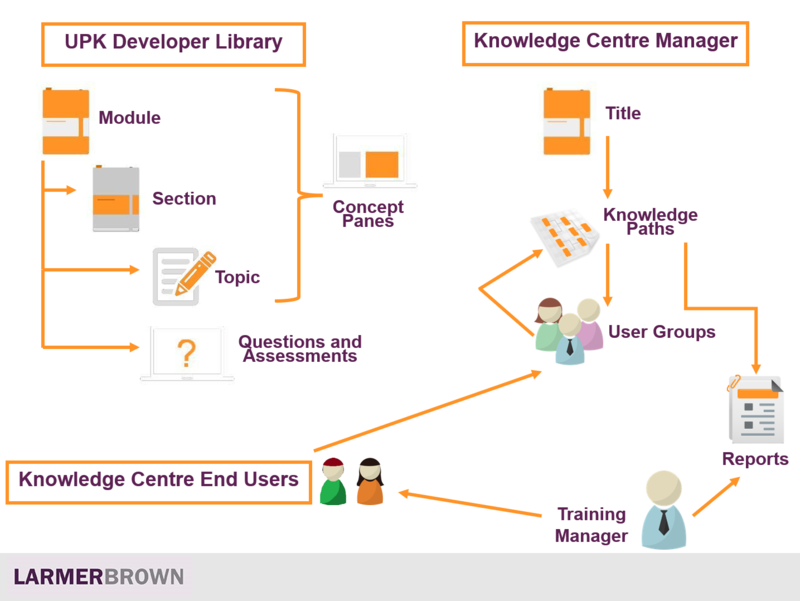 If you are using the Knowledge Center to manage the deployment of your UPK content, this can also manage the introduction of new or additional content so that users have one branded Training Portal for all learning - not just software simulation but any kind of eLearning. This will enable you to track and report on all your learning content, new and existing. You can continue to run this portal for as long as necessary. 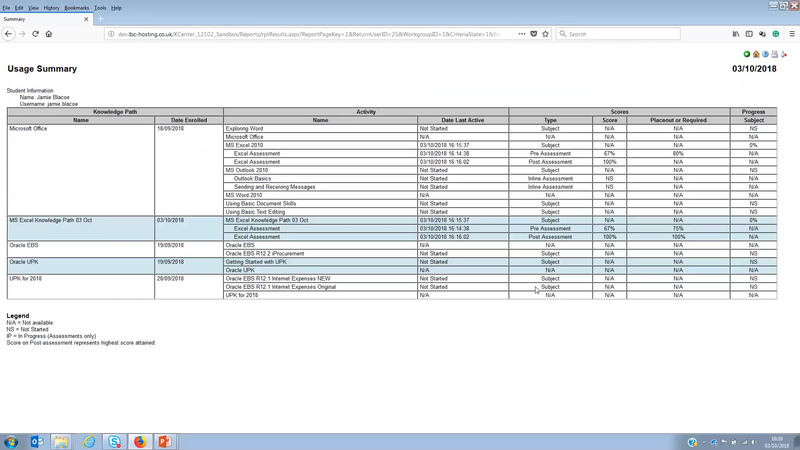 The tracking and reporting capabilities of the UPK Knowledge Center will also support your evaluation of what content you need to migrate to a new tool. By using Knowledge Center reports to audit usage of existing UPK content you can determine what, if any, content needs to be converted and migrated when you eventually say goodbye to UPK.